Book Your Winter Romance Package Now! Enjoy a 2-night stay in your private 1,400 sq. 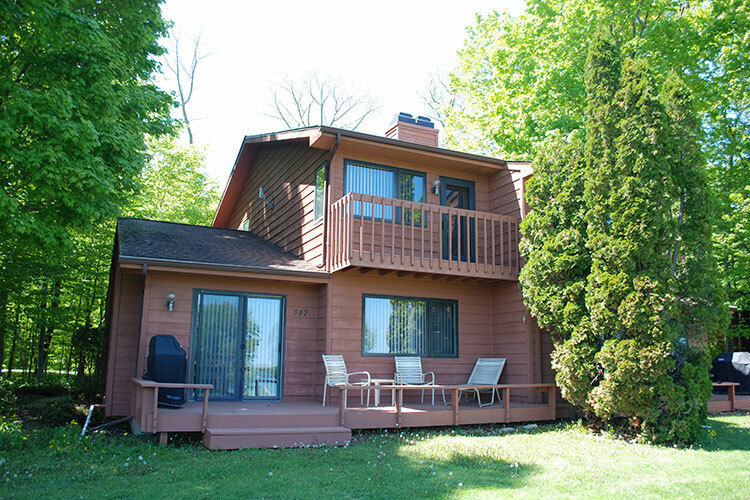 ft. two-bedroom townhouse that has everything you need for a perfect “ Winter Romantic Getaway” in Door County, Wisconsin, including a natural Door County stone fireplace and fully equipped kitchen. Upon arrival you will receive a $25.00 Door County gift certificate to use at any participating Door County business and a $50.00 gift certificate to the nationally acclaimed White Gull Inn in Fish Creek. The Rushes has 160 acres with complementary cross country trails, snow shoeing, and ice skating. After your outdoor activity, enjoy a swim in our indoor pool or relax in the indoor Jacuzzi and steam room. You can enjoy all of these amenities right out your back door. Two nights, $25.00 Door County gift certificate, $50.00 certificate to the famous White Gull Inn, and all the amenities and activities to make this a memorable stay in Door County for only $299.00! We offer a variety of different activities Monday through Thursday. There is something for the whole family or individuals looking for something fun and easy. Here are some of the things we have to offer; Kids Crafts and/or Stepping Stones with Brenda, Scrap and Stamp, Ice cream social, and Welcome Wine and Cheese. Click the link below to view a typical activities schedule and learn more about the variety of activities available at the Rushes and in Door County in general. It’s almost fall! The summer rush is over, but there’s lots of wonderful weather left. Book a mid-week getaway to The Rushes—a captivating resort and nature preserve on the shores of Kangaroo Lake, and discover how wonderful fall in Door County can be. The Rushes Offers Something for Everyone! The Rushes is a perfect spot for families, groups, and nature lovers of all ages. How about your own beach? With 2,800 feet of shore frontage, you’ll feel like you have your own private waterfront paradise! With the crush of the summer season over, you can enjoy the serene sparkling water and the sounds of nature all around from your canoe or kayak. Or maybe you prefer sitting in a comfortable chair watching the sun dance on the water. It’s all good. Bring Your Camera and Your Hiking Shoes! The Rushes Nature Preserve has 160 acres with walking trails that beckon you to explore. In September, butterflies and birds abound, deer and wildlife roam the woods, and the fall light casts a magical glow, making it an ideal spot for nature photography. Animals are busy this time of the year, and the nature trails (and mid-week quiet) let you get up close for that award-winning shot. Or take your camera to the beach to capture the stunning interplay of clouds, sun, and water at sunset. With a year-round complete recreation center, tennis, basketball, and more, there are tons of activities right at your doorstep. Seasonal recreation equipment is available if you haven’t brought your own. There are scheduled activities for all ages Monday through Thursday—including geocaching, guided nature walks, fun crafts, and an evening wine and cheese event with a bonfire on the beach. You can do as much… or as little as you want. Since the Rushes is a family-friendly resort, it’s easy for the kids to be off doing crafts or swimming while you’re relaxing in the whirlpool. Your private 1,400 sq. ft. two-bedroom townhouse has everything you need for a perfect stay—including a natural Door County stone fireplace and patio, high-speed Internet, two flat screen TVs, and a fully equipped kitchen. We make it easy for you to have fun! Hurry! Don’t miss fall in Door County! Book your mid-week vacation at The Rushes now. For those of you who enjoyed The Neighborhood Pub in Sturgeon Bay, you’ll be surprised that it is now gone! Yes-gone! It will soon be replaced by a CVS pharmacy. You’ll now have the choice of three pharmacy in close proximity: Wal Mart, CVS, and Bay Pharmacy. This will match our three east side groceries, Wal Mart, Econo Foods, and Pick n’ Save. Up north, Maxi’s at Maxwelton braes will be replaced by Pasta Vino. They have had good reputation for Italian food when they were in Sister Bay, Jacksonport and, Ellison Bay. The new Maxwelton owners bought the name and recipes. The old Common House in Bailey’s Harbor will now be the home of Chives, a successful Green Bay Restaurant. Taking up the slack from the pub will be the Door County Fire Company, formerly the Ladder house on Sturgeon Bay’s 3rd Avenue. Last year’s new addition replacing “Thyme”, “136”, is doing well and getting a good reputation. Ellison’s Bay Wickman House that replaced T. Ashwell’s is getting good reviews. Also the Wild Tomato in Fish Creek will open two new restaurant concepts in Sister Bay after one year of anticipation. Everyone has their Door County restaurants favorites. There are too many to mention. Our favorites: Donny’s Glidden Lodge (fine dinning); Kitty O’Reiley’s (pub fare); Stone Harbor (from casual to fine dinning); Al Johnson’s (breakfast); The Bluefront Café (lunch); White Gull Inn (breakfast); Norther Grill (pizza and pub fare). Also consider Mr. Helsinki’s, Whistling Swan, Parador, and Gordan Lodge. Check out the Door County Visitors’s Bureau! Keep up with all that’s going on here at the Rushes by reading our newsletter. Here’s the latest version for you to read and get excited about the summer coming up!